The latest store calendar has been released and it looks like the new Month of Star Wars is now October. 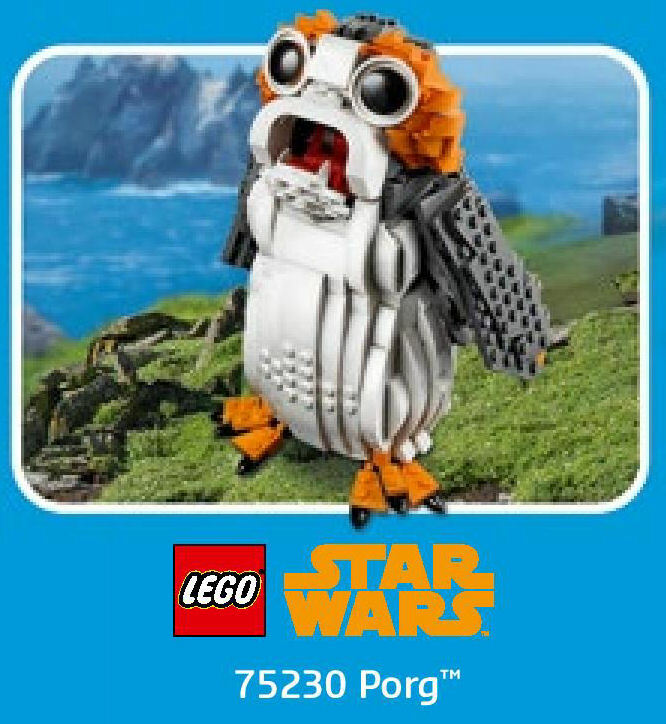 Without a doubt it's a very big month for the LEGO Star Warslicense with two new sets - 75222 Betrayal At Cloud City and 75230 Porg - coming out and two promotions being run. October 1st sees the release of the new big ticket, direct to consumer Master Builder Series (can you hear the drum roll?) 75222 Betrayal At Cloud City set. 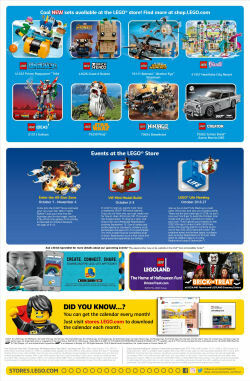 This is exclusive to LEGO shop@home and brand (including certified and LEGOLAND park and Discovery Center) stores. 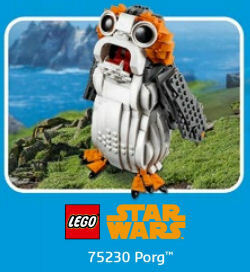 Also coming in October is the brick-built 75230 Porg. Until now there hasn't been any official communication about this set which was only revealed by happenstance through a series of accidental retailer page updates. 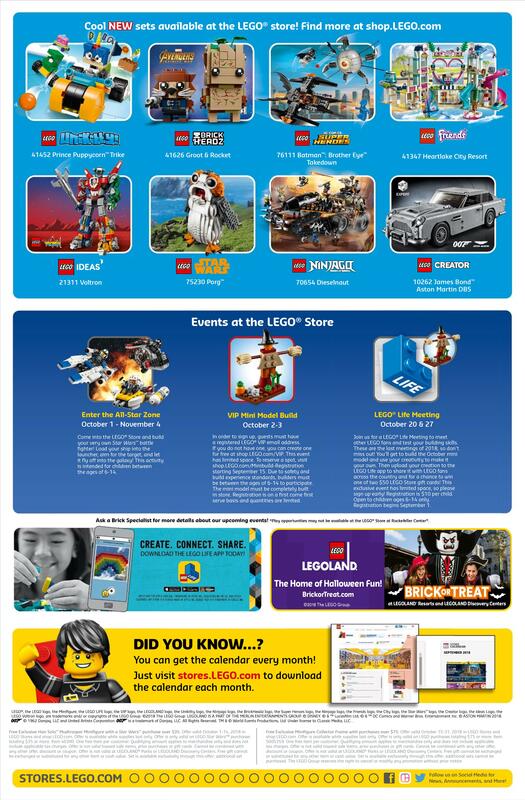 The new store calendar doesn't list a shelf date but information posted by the certified LEGO Store in Budapest gives a clear indication that October 8th is the day this bird flies the coop. 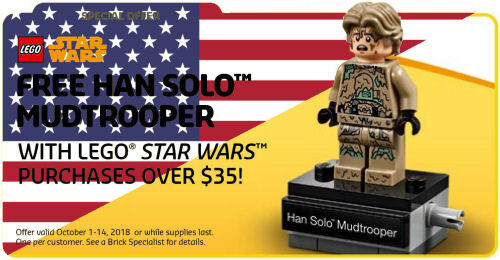 The surprise news on the US calendar is that the gift-with-purchase (GWP) that LEGO will be providing in conjunction with the release of 75222 Betrayal At Cloud City is the polybagged 40300 Han Solo Mudtrooper minifig that, so far, only LEGOLAND Deutschland offered up to park goers in July. The offer runs between October 1st and 14th and is available to any customers who spend $35 or more on LEGO Star Wars merchandise. Canada is having the same GWP offer, though with a minimum $50 purchase. 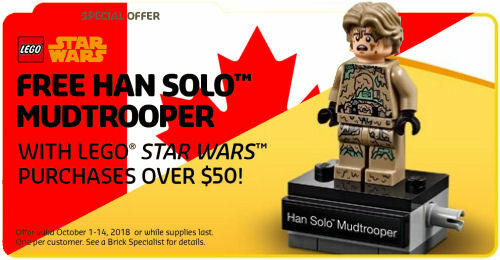 If LEGO follows standard procedure other regions outside of North America will have different offers running, and there's a chance that 30381 Imperial TIE Fighter,30498 Imperial AT-Hauler or 40299 Kessel Mine Worker may be included in October's offers in the United Kingdom, Europe and Australia. The final part of the Star Wars promotional festivities is an in-store build/race event for children. This activity is as clouded in mystery as the Kessel Run Adventure was during the May The 4th Be With You celebrations earlier this year, but from its brief description it is a fair guess they are one and the same. 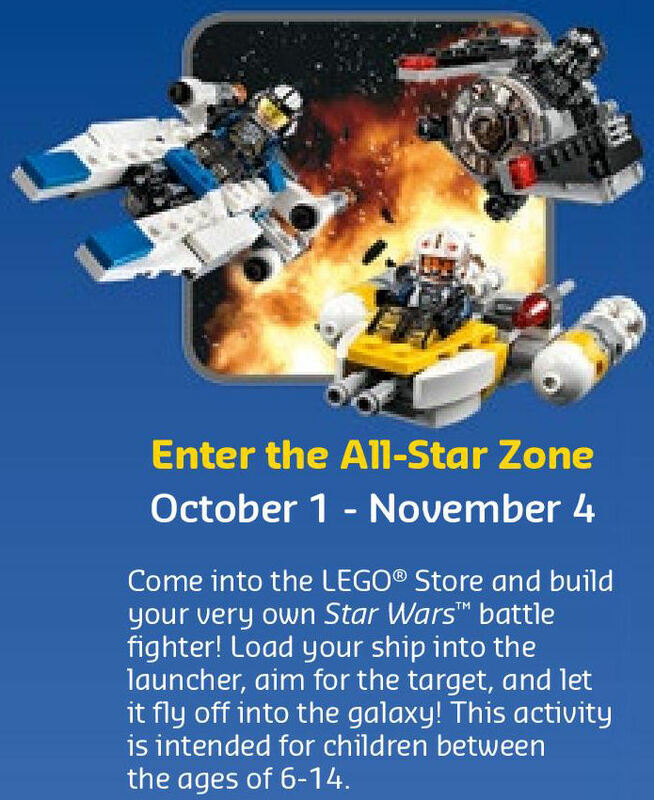 For those unable to visit a LEGO Brand Store between April 23rd and June 24th, 2018 and witness the Kessel Run Adventure in action, the activity amounted to a build event that had participants constructing simple space ships out of a small selection of pieces and letting them roll down a cardboard ramp. The last time this was run there was wording that made a clear connection to www.lego.com/life. This time around it seems to be missing. 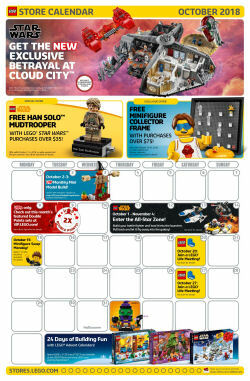 With thanks to brothers Brick Fan for sharing the news and the calendars, which you can view below. 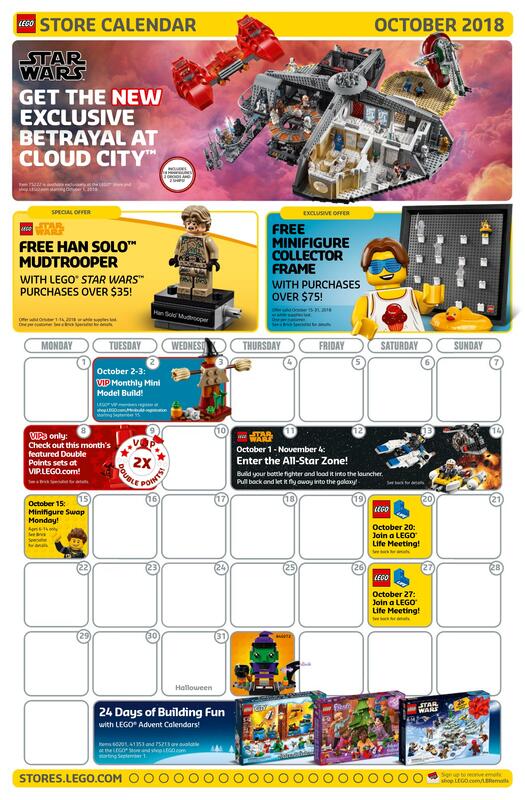 Oddly the calendar fails to include any mention of the release of two new LEGO Star Wars BrickHeadz sets - 41627 Luke Sywalker & Yoda and 41628 Princess Leia - which also come out on October 1st.